Samsung Galaxy Tab S4 - promolista! 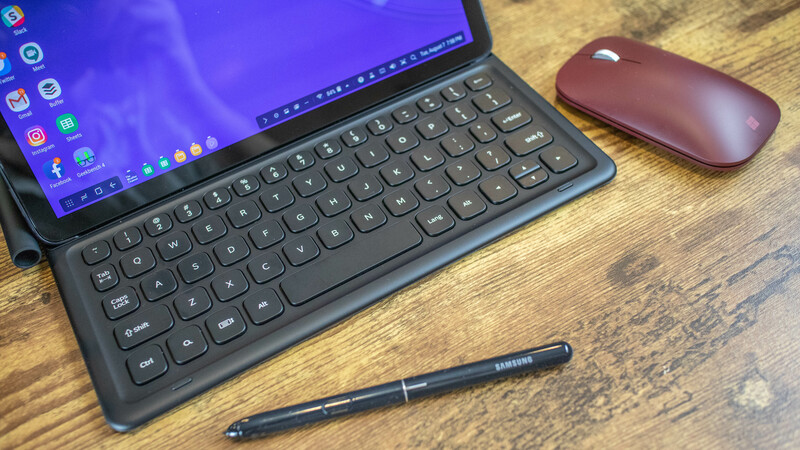 The Samsung Galaxy Tab S4 is the only Android tablet that can be labeled as a true 2-in-1 that serves as a tablet and offers laptop-like mobility. 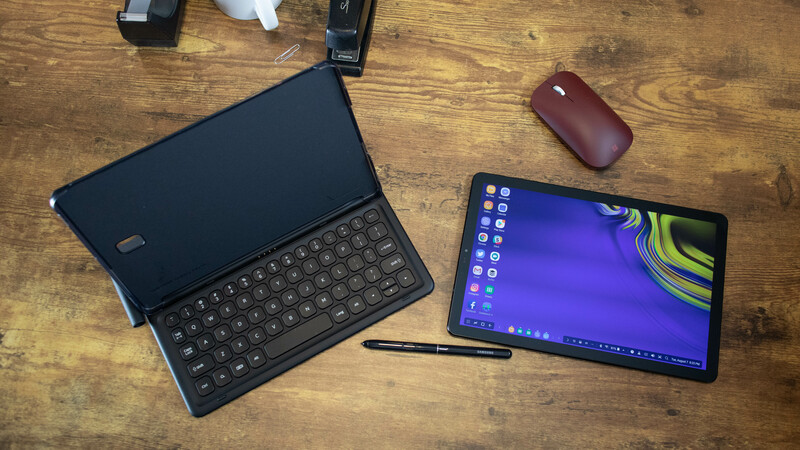 Notably, it&apos;s not as affordable as other Android tablets in the market either, reason being its high-end hardware and abundance of productivity features. But it still costs as much as Apple iPad, which is considered to be the best productivity tablet around. Precisely, it takes on the iPad Pro 10.5 with a bundled S Pen stylus, 64GB inbuilt storage and 4GB of RAM. All this comes at a premium cost of Rs 57,900. The key selling points over the iPad here is the bundled S Pen (Apple Pencil is sold separately) and the option for memory expansion using a microSD card. Additionally, the new built-in Dex mode, which mimics a desktop interface and has second-screen capabilities. Samsung has done a fine job at putting this laptop-like mode with re-sizable windows, system tray and task bar without adding any bulk to the software. Although it&apos;s an useful feature, the Dex still feels like work in progress. 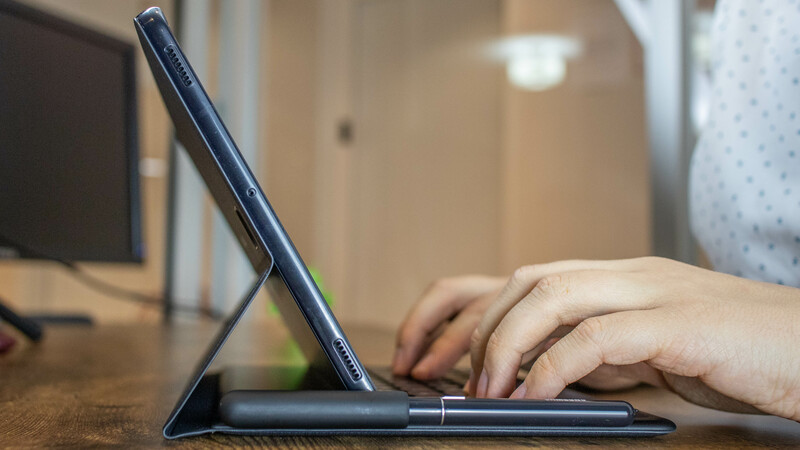 For instance, the touch interface isn&apos;t as touch-friendly, and for laptop like operations you need to invest in the optional keyboard cover which does not have a trackpad. You need to pair a Bluetooth mouse to navigate through the Dex interface. 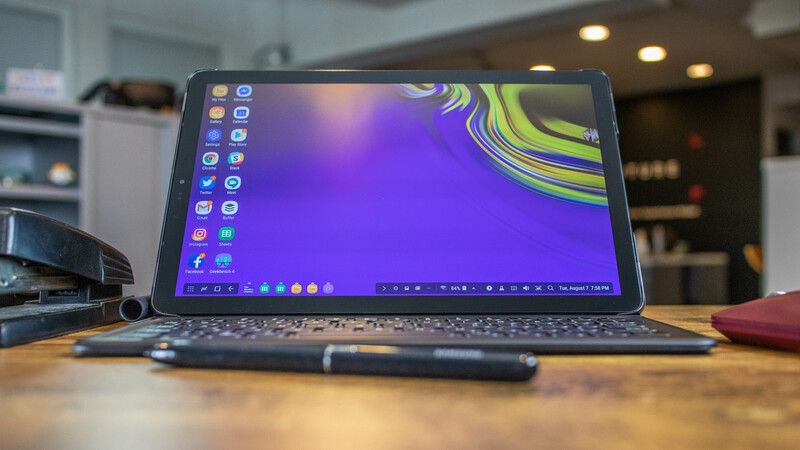 The specs lie a little bit: it actually doesn&apos;t matter that the tablet is underpowered on paper with an early 2017 chipset that’s easily outpaced by Apple’s laptop-rivaling chip speeds. Anyhow, the truth is our biggest issue with all tablets has little to do with stagnant specs and hardware performance. It’s that they’re always confined by restrictive mobile-first apps and interfaces. Samsung Dex tries to make good on that 2-in-1 promise with a real system dock so you can quickly switch between apps like on a laptop. They may not be refined but the Tab S4 introduces a lot of futuristic ideas that look like heading to the right direction. Since we don&apos;t have the Microsoft Surface Go or Chromebooks in India, Samsung still has a huge market to tap in. But is it worth the asking price? The Galaxy Tab S4 is launched at a price of Rs 57,900 and will be available from October 18, 2018 onwards in Black and Gray colors on Samsung Online Shop and leading offline retail stores. It will also be available on Amazon, online exclusive partner from October 20, 2018 onwards. As an introductory offer, you can buy the device and get Rs 5000 cashback on HDFC Bank Credit Cards, and EMI on HDFC Bank Debit Cards and Consumer Durable Loans. Galaxy Tab S4 customers on Jio 4G, would be entitled to get instant cashback of Rs 2,750 on recharging with Rs 198 or Rs 299 plan. They would also get double data benefits on every recharge for the next 4 recharges, giving them the freedom to enjoy streaming cricket, music, video and much more. Samsung’s new built-in Dex mode is a hit and a miss. It transforms the normal Android look into a desktop-like interface. Meaning, apps are left-aligned (like on a Windows PC), clicking on an app opens re-sizable windows, and there’s an app dock and system tray at the bottom to flip between open apps and configure all sorts of quick settings. Ideally, all of this should work seamlessly on a 10.5-inch display, but the experience tells a different story. Resizing app windows and touch detection is a bit off. It makes simple tasks like tapping the close button (X) in the top right corner bit of a chore. It&apos;s simple, you either need the S Pen or a Bluetooth mouse to operate the Dex mode without an issue. Samsung’s core software works fine, but apps as popular (and as standard) as ones from Google should work without crashing. 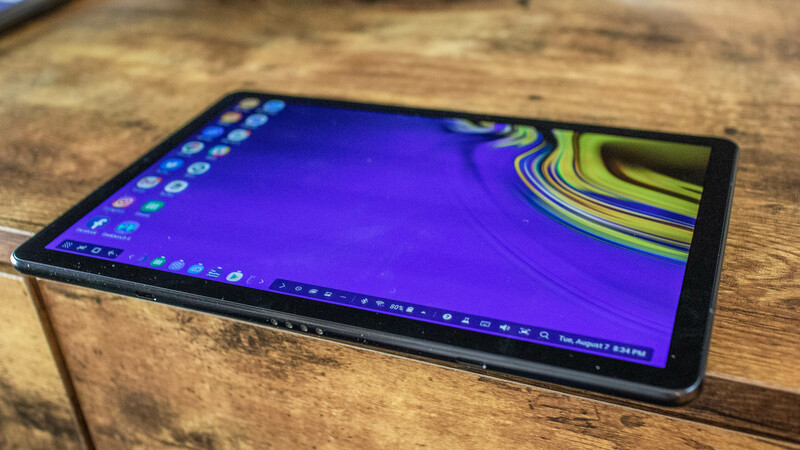 Google Docs crashed several times while we wrote this review on the Tab S4. 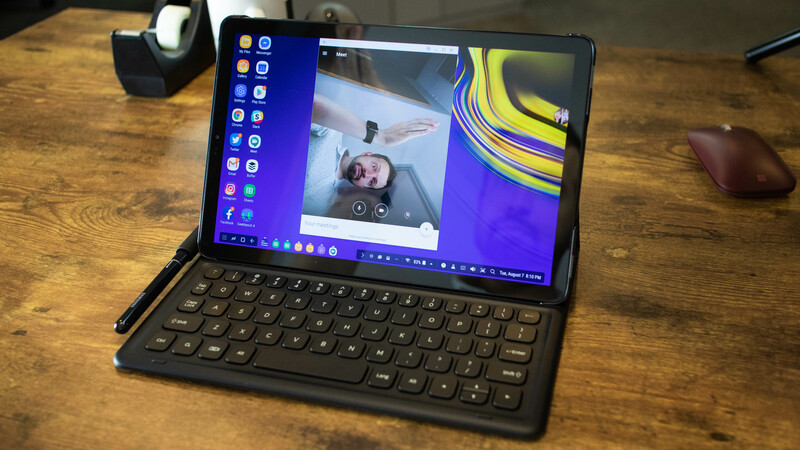 Another issue we faced while using Hangouts Meet is that we’re sideways to everyone else whenever the Tab S4 is in landscape mode and docked on the Book Cover Keyboard. The simplest fix is to turn the tablet to right ourselves, but then it turns other people on the call sideways on the screen. We did connect a Bluetooth mouse to get the best out of productivity, and to be honest, it worked well in both Dex and normal modes. However, it&apos;s not ideal on a commute or at a tight space. The idea behind the Dex mode is really cool, but Samsung has to work on fixing the design flaws to get better to let its users make most out of the productivity features available. As a standalone tablet, the Samsung Galaxy Tab S4 is a fine experience. But the moment it docks with the optional Book Keyboard Cover, things get messy even though the setup looks like a dream. Especially for those who work on the go. Given the size size of the tablet, the keyboard feels slightly cramped until you get used to it. It isn&apos;t backlit either, which means you have to use the light from the display in darker conditions. The layout is slightly different from Mac and Windows keyboard. We advise you to invest in the keyboard only if you have tried it and are ready to deal with the learning curve involved. 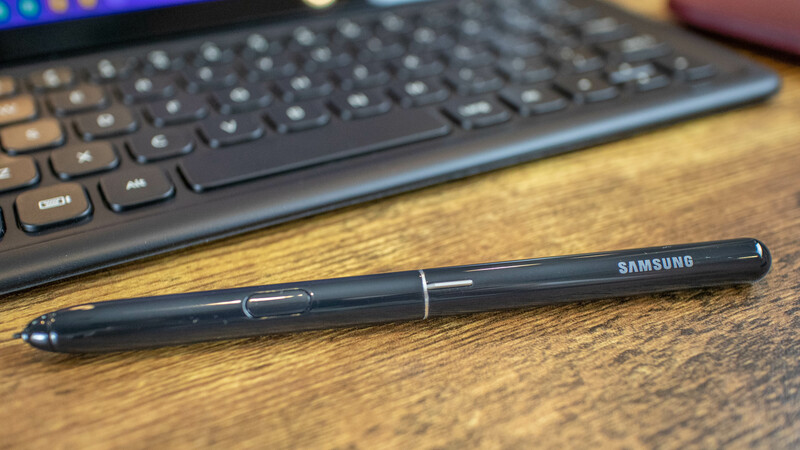 Samsung includes a tablet-appropriate S Pen (larger than the Note smartphone S Pen), and this one is more rounded and feels more natural to hold than last year’s Tab S3 pen. There’s a tiny metal protrusion in the middle of the stylus to prevent it from rolling away. There’s also a stylus holster that clips onto Samsung’s keyboard and it requires no charging whatsoever to use. This contrasts really well with the Apple Pencil, which does require charging, has no holster on the iPad keyboard, and rolls away each and every time we set it on a table. S Pen functionality is typical of a Samsung tablet or Note phone. You can draw, jot down notes, annotate screenshots, translate text, and new this year (on the tablet at least) is the ability to send Live Messages. Sadly, the Air Commands (shortcuts to use these features) don’t work in Dex mode. After Apple iPad Pro 10.5, Samsung has upgraded this year&apos;s Android tablet with a 10.5-inch Super AMOLED display, erasing a noticeable amount of needless bezel around the screen. Samsung has eliminated the physical home and capacitive navigation buttons on the front, allowing it more space for a bigger 10.5-inch super AMOLED display over last year&apos;s 9.7-inch. Like its phones, the tablet now gets an edge-to-edge treatment but it&apos;s not completely bezelless. The on-screen buttons work great, just like they do on the Galaxy S9 and S9 Plus, and the HDR display is punchy and bright. The iris scanner that replaces the fingerprint sensor works fine if you’re in front of the tablet at a good angle. We were using pin code to unlock the device most of the time. But there&apos;s a lot more forgiveness here as you don&apos;t open up the tablet a lot of times in a day like your smartphone. Holding the glass and metal Galaxy Tab S4 remains easy, even with slight bump in the dimensions that the Tab S3. Of course, the glass back is fragile and prone to smudges, you might want to buy the book cover keyboard case with it. If you are looking for a third party case, make sure it&apos;s not blocking the four-sided AKG-tuned speakers which sound great. Samsung’s new Daily Board software means that while the Tab S4 is an Android 2-in-1 tablet by day, it can turn into a photo gallery – and information-filled nightlight – by night. It displays the weather, time, and calendar at launch, along with a slideshow of your photos. Sadly, we found photos are currently limited to on-device pictures and it doesn’t connect to something we are more accustomed to, like Google Photos. The battery life on the Tab S4 is stellar. Its 7,300mAh battery capacity is a step up over the 6,000mAh battery we got in the Tab S3, and in this way it’s much better than an iPad. In our on-screen battery test, we were able to run a 60-minute looped HD video with full brightness on WiFi and only experience a 10% battery drop. The Tab S4 supports Fast Charging, and our tests shows that it recovers 18% of its battery life (from 0%) in just 30 minutes. That’s a lower percentage than the S3, but keep in mind that this is a much bigger battery. So fast charging is confirmed and you’ll have a full all-day battery in 3 hours and 16 minutes from a fully depleted Tab S4. No surprise, that’s faster than iPad charge times, and thankfully, Samsung includes the fast charging equipment in the box. Like we in the beginning of this review, the specs are just numbers in this case. The same applies for the 4GB of RAM. 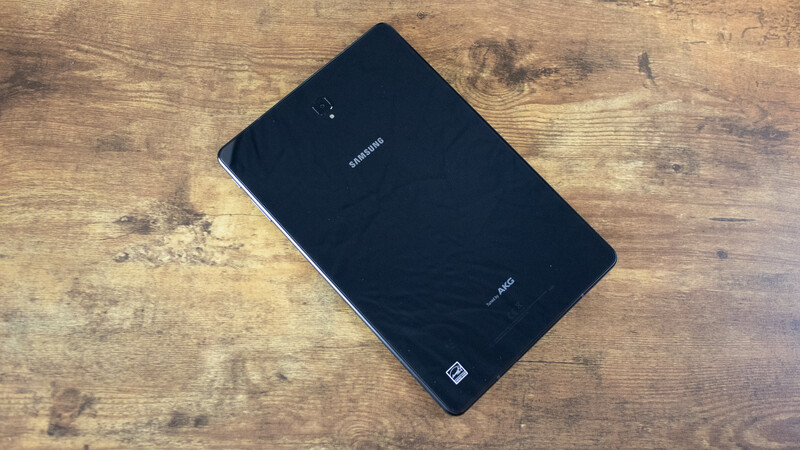 Samsung has always held back on the specs for its tablet, but the performance here is okay. Something similar goes for the front camera as well, as your tablet camera usage is or should be limited. After all, you have to live in a society which will shun you if you&apos;re found clicking photos with a tablet. Especially, in public. There’s a 13MP camera on the back and an 8MP on the front. The rear camera records video in 4K and the front is at 1080p. The front camera is good enough for video calls, as long as the software allows for screen rotation. We have already mentioned our annoying experience while using Google Meet. While other apps like Skype worked fine, it&apos;s still going to be difficult to convince your entire organisation to switch to the software which works well on YOUR tab. 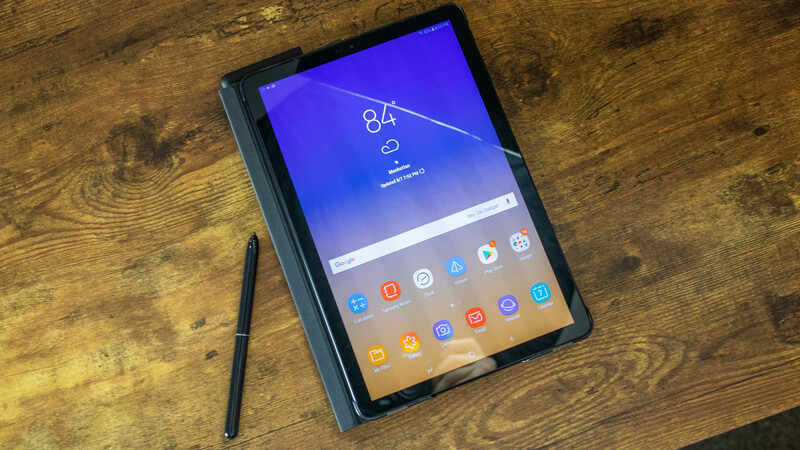 The 10.5-inch display, longer battery life and Dex make te Galaxy Tab S4 an upgrade over the Tab S3, but it comes with a higher price and big claims to do so much more. The core idea behind Samsung Dex for its desktop interface is likeable, but it still feels unfurnished because of the non-touch-friendly UI. Although we really liked the quality and form factor of the keyboard cover, it still felt cramped and we did miss a trackpad. The shift from a Mac or a Windows laptop to this keyboard isn&apos;t smooth either. As much as we like re-sizable app windows and a heaven-sent app dock and mouse support (Apple should learn from this), the software, including Google software, isn’t optimized well enough for this tablet. However, Dex is a great blueprint for iPads and all the other Android tablets coming in the future. We would like to see a more touch-friendly interface, a more naturally adaptable and intuitive keyboard with backlit keys.